Where do I use my Camping & Co voucher code? Camping and Co have a range of top campsites in locations like France, Spain, Italy, Portugal, Algarve, Grau du Roi, Argelès sur Mer, Costa Brava and Costa Dorada. The top campsites available with Camping and Co include Campsite Le Brouet, Campsite Les Coques d'Or, Campsite L'Oasis, Campsite La Kilienne, Campsite La Grand' Terre, Campsite Cayola, Domaine de la Bastide, Domaine du Cèdre, Campsite Tikiti and Campsite Iscrixedda. As well as camping trips at these campsites you can also enjoy holidays at campsites like Morbihan, Vendée, Gironde, Bouches du Rhône, Ardèche, Dordogne, Gers and Landes. If you’re looking to rent a mobile home you can also do this at Camping and Co. Discover mobile home rental campsites in destinations like Languedoc Roussillon, the French Riviera, Aquitaine, Brittany, Pays de la Loire, Normandy, Southern France and Cornwall. If you’re looking to save money on your camping trips, holidays or mobile home rental you can find great discounts in the special offers section. If you’re looking for inspiration and extra information on Camping and Co holidays then check out the holiday ideas section. 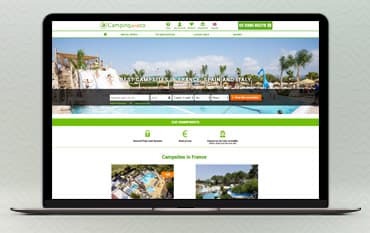 Here you’ll find a ‘campsite by theme’ section where you’ll find information on campsites with direct access to the beach, coastal camping in France, campsites with kids clubs, campsites with water parks, campsites with indoor swimming pools, dog-friendly campsites, campsites with pitches and campsites with mobile homes. As well as this you can also find a tourist holiday section where there’s information on Disneyland Paris, Port Aventura and the Palace of Versailles, as well as a favourites section where there’s great advice on all of Camping and Co’s top destinations. Camping and Co provide a seaside section on their website where you’ll find information and deals on coastal camping in France. Camping and Co recommend 82 campsites in France, all of which are less than 6 miles (10 kilometers) from the sea. You can search for coastal campsites in France using the search tools on the Camping and Co website. Select your ideal location, swimming and wellness facilities, accommodation options, entertainment and leisure activities and shops and services and hand pick the perfect campsite for a seaside camping holiday you’ll never forget. How much money needs to be paid at the time of booking? A down payment of 25% of the total amount of the booking is paid at the time of booking. Any request for the cancellation of a booking made by a customer must be submitted by a registered letter with acknowledgement of receipt. With a wide range of destinations, high-quality accommodation, a variety of activities and comfortable lodgings, you can experience a camping trip like no other with Camping and Co. As the camping holiday experts, Camping and Co are able to offer a large range of quality campsites in France and in Europe, all of which have been hand selected by a team of holiday experts. Camping and Co work hand in hand with the best agents and camping chains to guarantee holidays and accommodation to suit all tastes and budgets, book online with a Camping and Co discount code from us and you can save money on your camping experience too. We are constantly on the hunt for Promotional Codes for Camping & Co to help you with your money saving. Our experts check dozens of sites for secret codes including NHS discounts, student sites & social media channels saving you time & money!